Shocking footage has emerged of a London Tube passenger repeatedly hassle a blind doctor to move his guide dog out of the way so he can pass him on the escalator. 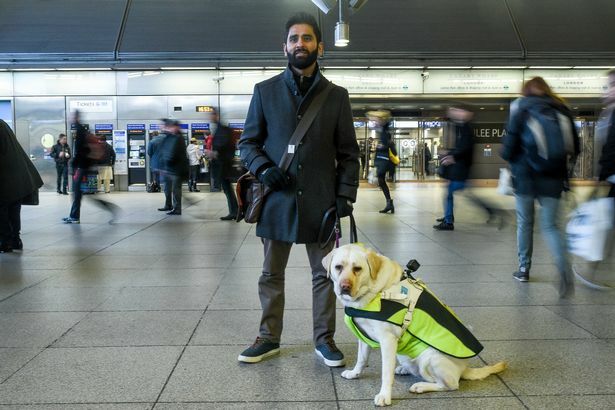 Amit Patel, 37, was accosted while he was descending an escalator with his guide dog Kika at London Bridge on Tuesday - in an incident which was caught on a DOGCAM. Mr Patel used to work as an A&E doctor before a haemorrhage stole his sight five years ago and he relies on his guide dog to navigate London. He said that he has experienced so much abuse from London commuters that he attached a camera to his guide dog which recorded this distressing interaction. The angry commuter - blind himself to his own lack of humanity - accused him of wasting her time and repeatedly asked him to move his dog. Video records the impatient commuter saying: "I want to get past." Mr Patel responds: "I can't do that, she's a guide dog". But the cruel and inconsiderate traveller says: "I know that!" A Transport for London worker who was assisting Mr Patel interjected and said: "How do you expect him to move, he needs to hold onto the handrail." But incredulously the passenger said: "Just let go of the handrail so I can walk past." Mr Patel said that he is constantly barged and pushed out of the way as he navigates around the trains and buses of London. commuters in London have previously hit his specially trained dog with umbrellas and shopping bags to move her on escalators. "It really scares Kika sometimes, I can feel how upset she gets and when I get upset she senses it and she won't go on the escalators for a few days," said Mr Patel, who relies on public transport to navigate London," Mr Patel told MailOnline . But despite her treatment by some Londoners, brave Kika continues to serve her master and even saved his life by throwing herself in front of a car when the vehicle broke a red light. Only 5% of guide dogs are trained to help their owners on escalators. Mr Patel's wife takes the footage recorded on Kika's back and shares it on Twitter to raise awareness about how the visually impaired are treated by the public.